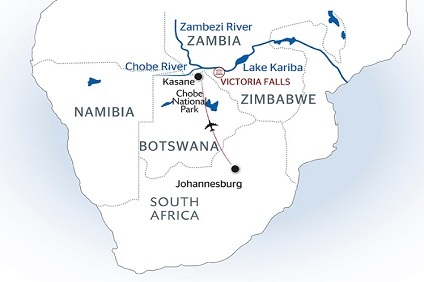 The African Dream sails on the Chobe river. Facilities: panoramic lounge bar restaurant and a large observation deck for an hitherto unseen immersion in nature a sublime and intimate rooftop for recreation and relaxation. Two twin beds (35”x75”each; can be joined into a single, larger bed), air conditioning, bathroom with shower, TV, safe, 220 V electrical plugs, equipped with adapters for most countries.